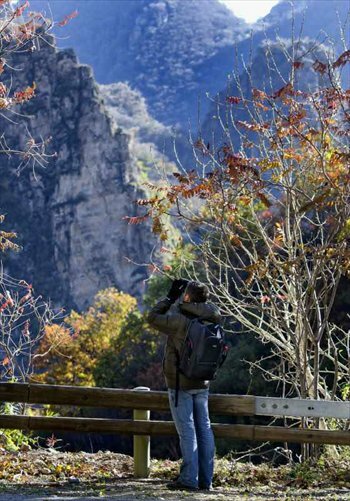 Most people think of Beijing as a densely-populated metropolis that is home to several scenic spots and historical sites, but few realize that it's also a great place for birdwatching. Terry Townshend, a British birdwatcher and conservationist, has spent the past five years proving this fact, spotting more than 380 bird species out of the 460 that have been sighted in the Chinese capital, more than London, Washington DC, Moscow and Tokyo. "When I first came here, I couldn't find much information about where to go and the birds in the city. Everyone told me that there are no birds in Beijing," Terry said in an interview with the Global Times in a coffee bar on Wednesday in Beijing, shortly after he finished a Chinese lesson with his private teacher. But the facts he discovered while on his birdwatching trips surprised him. "There are even more birds than I saw in England," he said. And he has found that due to its geographic location as well as its reservoirs, wetlands and parks, Beijing serves as a major stop for most migratory birds that spend the summer in the forests of North China, Mongolia and Siberia. 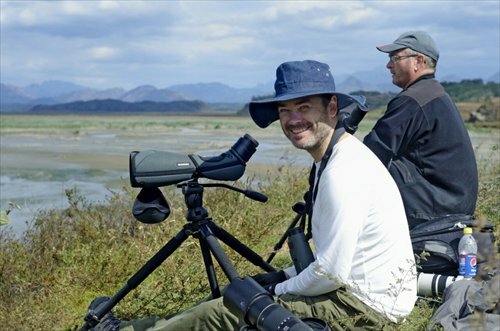 Terry, who has watched birds in several other countries, has traveled across more than half of China and believes the country is one of the best places in the world for birdwatching due to its diversity of species and migration movement. Official figures show that China is home to about 1,400 known bird species, or 14 percent of the world's total, following Colombia, Peru, Brazil, Ecuador and Indonesia, which are each home to more than 1,500 species. However, birdwatchers in China are scarce compared with other countries. "In Britain, when I go to a well-known place for birdwatching, there may be more birders than birds. In China that doesn't happen. 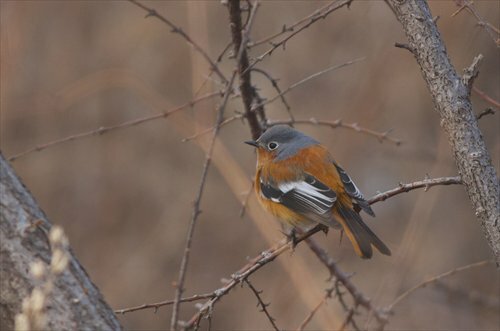 When I go to Miyun Reservoir, it's unusual to see another birdwatcher," he said. In the UK, with a population of around 64 million, some 3 million adults go birdwatching every year, says the RSPB, a UK charity working to secure a healthy environment for birds and wildlife. "But in Beijing, with 20 million permanent residents, there are only a few hundred members of the birdwatching society," Terry said. He thinks the major reason for the gap is that Chinese schools don't teach enough about the environment and seldom provide opportunities for students to get close to wildlife. Birdwatching is not only a great hobby that allows people to get close to nature and relax. For Terry, it is also a way to learn about and raise awareness of protecting the environment. "You can watch birds anywhere. Even in a city, you can go to a park. And you can do it on your own or in a group," he said. However, he has found that the number of birders in China is growing. EcoAction, a Beijing-based company dedicated to ecotourism and environmental education, which Terry became director of this year, started piloting a program this September. They voluntarily provide a 30-hour course in two middle schools in Beijing, giving lectures and organizing field trips. Born in the village of Winterton-On-Sea in Norfolk, UK in 1970, Terry said he has been fascinated with birds since childhood. At the age of 4, the twittering birds in his back garden interested him greatly. To satisfy his curiosity about them, his parents bought him a book, The Hamlyn Guide to the Birds of Britain and Europe, which grew his passion for wildlife and the environment. Terry is an expert on environmental legislation. He was the lead author of the first edition of the groundbreaking Global Climate Legislation Study, which examines climate change-related laws across the world, and remains a co-author today. In 2010, he came to Beijing to take a job at GLOBE International, an international NGO that works with legislators to advance environmental legislation. Despite his busy schedule, he still manages to spend the majority of his spare time birdwatching. Now, Wild Duck Lake, Miyun Reservoir and Lingshan Mountain in the suburbs of Beijing are his favorite haunts to indulge in his pastime. 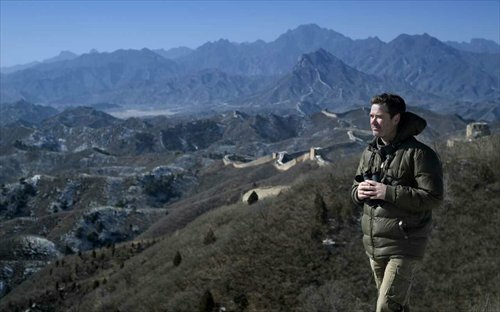 In 2010, he built the website birdingbeijing.com, which he constantly updates with his discoveries, activities and observations on birdwatching and protection, in photos, stories and videos. He has even made a map showing which places are best for watching various kinds of birds in the city. He says that he does all of this in his spare time and out of his passion for the environment. He said that last year, he left GLOBE International, but he continues to undertake environmental legislation-related consultancy projects. One of his biggest sources of pride in China is his efforts to help save some of China's most endangered birds from extinction. In 2012, he started a campaign to save Jankowski's bunting, a bird that wasn't listed on the national protected wildlife list in China. After learning that the bird might be endangered, he wrote articles, did interviews, and worked hard to raise donations. With the funds, he first arranged a survey of the bird, which mainly resides in the Inner Mongolia Autonomous Region and Jilin Province, investigating its population and threats to its existence. They found that the bird's numbers had dwindled to 200, and that the major reason for this decline was the large-scale destruction of their habitual grasslands due to farming. Terry said they then organized visits to local schools and residents to promote knowledge of the bird. At the same time, they conducted talks with local officials, proposing ways to protect the birds' habitat while also compensating farmers for their losses. When he encountered offenses such as illegal trapping or sales of wild birds, he either reported them on his Twitter and Sina Weibo accounts, or directly called the police. Terry had planned to leave China in 2013, but he still remains. He said currently he has no plan to leave China. "I don't like to make plans. I enjoy living in China. As long as I feel I can contribute to a better environment and I am wanted here, I will stay," he said. Currently, he is lobbying some companies to fund the tracking of Beijing's cuckoos, a bird that is commonly seen in the city, but whose winter home remains unknown.